Finally, the main generator failed. Second half of last day they worked using 100 Watts only. Tomorrow they will leave AS-104 and go to AS-087. AS-068 won't be activated - they are coming out of the schedule. 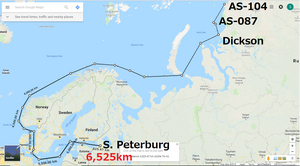 The yacht has to get back to St. Petersburg before the 7th of October, otherwise the floodgates will be closed. The trip to AS-087 will take about 2 days. There the yacht's main generator will be dismantled and RI0B should be back on track with appropriate power. If no luck - they will continue with 100 W. Same 3 operation positions will be used.